Shy, Donna Lariviere grew up on a small family farm in Dayton, Maine. When this happy girl entered elementary and middle schools, she struggled while other children seemed to breeze through lessons. To compensate, she spent recesses and lunches trying to understand information others took for granted. It became hard to make friends with so much time and energy being invested in keeping up with the information flooding past her. By high school, she accepted academics would always be a struggle and socially she would be lucky to maintain even a few friendships. Those years of hard work, mediocre grades and loneliness were only survivable because of her horses at home. Those beautiful animals gave her a sense of peace, friendship and accomplishment. Truly, they saved her life. Though high school was drudgery and near failure, Donna became a practiced equestrian. During evenings, weekends and summer breaks she trained with her precious horses and soon found herself showing and training with award-winning riders like Cleve Wells, Bryan Neubert and Buck Brannaman. After salvaging a diploma from the wreckage of her high school years, Donna enrolled in college. There hard work failed her. Tests and quizzes came back non-passing, failed, failed, failed. Defeated and depressed, Donna sought help. Her professors tried but she just couldn’t absorb the concepts. Finally, one professor suggested she be tested for a learning disability. Though horrified, Donna sought experts. Sure enough, her eyes tangled written words before they reached her head. The solution: read slowly to understand individual words, read a second time to put together the larger concept, read a third time to comprehend the whole. Donna finally had a solution that would allow her to move forward. A few years later, diligent hard work and a focus on overcoming her learning disability found Donna earning a Bachelor of Science from the University of New England. Her equestrian career was also reaping benefits. A trophy shelf now held a Superior on the American Quarter Horse Show Circuit, a Qualifier for the American Quarter Horse Association World Show, and a number of retired yearend awards. Academically, Donna went on to hold a conditional certificate to teach science and was published in the Journal of Neuroscience. At the University of Southern Maine, she earned her Master of Occupational Therapy, was on the Dean’s List, and was elected as Co-President of the Occupational Therapy Student Government. 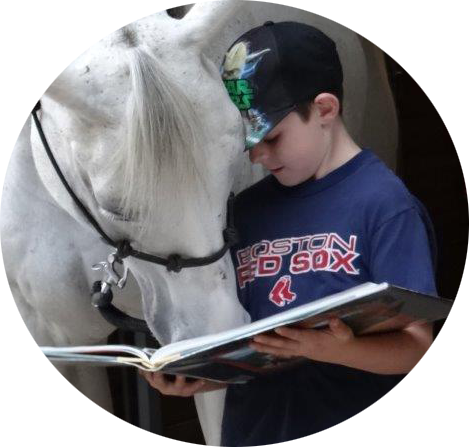 Today, Donna has specialties in Sensory Integration, Therapeutic Horseback Riding and is a Level II Registered Hippotherapist (treatment by a licensed therapist who uses the help of a horse). Hard work is still a part of this single mother’s full and rewarding life. Along with raising a busy and bright nine-year-old boy, she currently juggles four jobs along with her duties at LaDawn Quarter Horses Therapeutic Riding Center, a nonprofit she founded and where she now serves as primary therapist. To learn more about her work experience and credentials, view her resume!